1. 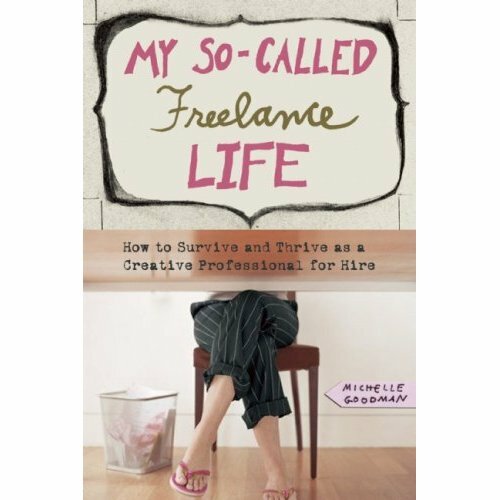 It’s called My So-Called Freelance Life: How to Survive and Thrive as a Creative Professional for Hire, and it’s due out this fall from Seal Press. 2. I interviewed several of the working class heroes I mentioned yesterday for it. 3. Kate Basart, the fab designer who’s responsible for The Anti 9-to-5 Guide’s good looks, did my new cover too. (Clicking the image at the top of this post will make it bigger, in case you were wondering.) Note the recurring post-it motif! Also, note that those are not my feet, though I do own a pair of pink flip-flops. 4. Just a hunch, but I suspect publishers like to announce their books on Amazon as early as possible so their authors can’t weasel out of their deadlines. I am going to buy your book this fall, for sure. I am a web designer here in Seattle who just left my full time firm job 6 weeks ago to go freelance, I am loving it! I just celebrated my one year anniversary as working as a full-time freelance web and graphic designer. I quit my other job right after I read your book! I can’t wait for the next one. Sounds like an excellent read, I can’t wait to pick up a copy. I recently found your blog, it’s really great – so much good information. I met you in SF on your last book tour. Congrats on the new book, sounds great!! Congrats. I will definitely be buying the book. I bought your first book, and am still inching my way out of my 8 to 4 job. It’s really hard giving up the security of being a teacher, but freelance life is calling. I figure if I have the energy to still run a side business (in preparation for the jump) then what do I have to worry about? hey everyone, thanks for the vote of confidence and all your kind comments. congrats, liz and rebecca. very cool! jenny, yeah, i think i need a slap. thx for reminding me to get offline. toni, i WISH i was gonna be early. sigh. jaclyn, thx and welcome to the orange blog! andrea, thx for coming to my reading — so appreciate the support. sandra, good luck fleeing; i suspect we’ll be hearing all about it soon enough. mir, same here. and thanks! Oooh, it looks awesome! Congrats, I can’t wait to read it! Didn’t preorder but did add it to my wish list at Amazon! Now I’m here to check out your blog a bit too! Take care! thanks, Alexandra & Hanna. all you folks rock! I first saw you in BUST! I’m so glad I found this site as I am a nascent freelance writer/blogger/independent radio producer. I am so excited to read the new book. Congratulations, Michelle! I love the cover design — it’s so purdy. So excited to see the new book! Just discovered you thanks to Kristen Fischer! I am going to order you first book today. I leaped from the corp world 5 years ago and have never looked back. And, I couldn’t agree more about the ideal day – my dog would kill for 3 walks a day! Why can’t my clients understand that and be a little more patient? I blog about this crazy lifestyle too at LifeonTheLedge.wordpress.com but not as diligently as you. Great work! Congrats! That is so fantastic! Yippee, I am so very, very happy for you. And way to bang ‘em out, by the way. Hello – I noticed that the bottom of the front cover of your new book is the same as the bottom of the front cover of “Love @ first site” by Jane Moore. I was wondering, is there any relation between the two books? i guess the connection is that our publishers both used the same stock photo art. I am SO pre-ordering your book. Brava! I’d love to do a Q and A with you for sure at http://www.babycenter.com — if you’re game! Lots of freelancing mamas who’d love to hear what you have to say.